Should You Tint Your Greenhouse? Everyone knows the summer sun can get intense in Nashville and it makes for some incredibly hot days that can damage your entire garden in a matter of hours. While many are content to hang tarps or sheer screens over their plants to protect them from damaging UV rays, more people are looking into greenhouses as an alternative garden space. 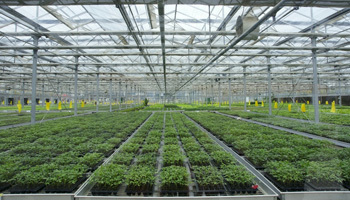 Traditional greenhouses are made of clear glass panels that won’t do much to mitigate the intensity of the sun. Just like any room in your house, your greenhouse can benefit from tinted windows. Greenhouses are inherently humid and warm. The more you water, the more the humidity of the room climbs. During the peak summer months, the sun can raise the temperature to dangerous levels. Remember, not all plants thrive in heat. Adding window tinting to your greenhouse can help regulate the temperature without the use of fans or air conditioning. Installing shades and window coverings will lower the temperature and keep the sun from harming your plants when it’s especially strong. However, they often block most of the light, forcing you to use indoor garden lights to accommodate the lack of natural light. Window tinting film still allows light to enter your greenhouse. Our film is available in different shades of darkness, so we can find the right solution for your garden. Window tinting both keeps your greenhouse cooler in the summer and warmer in the winter, saving you money on heating and cooling costs. If you’re looking for a way to keep your plants happy year-round, call the experts at Accu Tint today. We use only the highest quality premier film available for all of our home window tinting services.